Even though it doesn’t feel like it, I’ve kept myself active over the last few days. I realized that I shouldn’t interact with entities and elements that oppose each other in nature or temperament. I conjured Auriel after working with Raphael, and I felt like hitting a brick wall at high speed (air + earth). It’s helpful, though, and Auriel offered me advice to slow down before I hurt myself (I had a hard time keeping up with myself at the speed of thought I was going), but good lord. Plus, going from omg-so-active-buzz to I-dun-wanna-move-gimme-cookies and back was a little rough. A while back, I got an ice pick that I wanted to use as a Solomonic burin for inscribing stuff. I consecrated it according to Frater Quaero Lux’s directions on Friday at dawn. Pictures are up in the Crafts section. I spent the night at the house of a friend and mentor on Friday night. I’m also getting involved in a pagan mystery tradition, so this was a good chance to learn some of the basics I’ll need to know and practice; since it involved a fair bit of qabbalah review, it was pretty easy to connect different traditions into a more unified worldview. Good dinner, too, in Dupont Circle. Afterwards, we went to Michaels so I could get a bunch of crafting supplies, and later, I bought even more supplies from Amazon to finish that fire wand project from before, amongst other things. Saturday afternoon, once I got settled in, I spontaneously decided to make a Golden Dawn-style pentacle for my budding altar. Instead of being clay, I took a circular wood plaque, plotted out the diagram, woodburned it, colored it, wrote the Hebrew names of earth-related things and their Rosy Cross sigils, and applied some stain and finish to it. Pictures are up in the Crafts section. It’s not entirely canonical according to GD practice, but it’s very close and only has what I consider minor stylistic derivations. Earlier today, in addition to my normal routine and contemplating the King of Swords, I performed a conjuration of my genius in the day and hour of the Sun, acting on the hint I got from the contemplation on Thursday night. I was able to conjure him, and I felt his presence, but the connection was very faint and I couldn’t really get much, not even an image of a seal. It was like we were trying to communicate but we couldn’t get much across, or at least from him to me. He appeared hooded or veiled, and we agreed that I should try this again some other time. He did agree to help me out with dreams and recalling them, but for now, I’ll shelve working with him or other celestial entities. Whether this is because I’m not yet ready to really talk with him or because of some temporary thing is unclear to me (I did become really sleepy shortly before the ritual), but I did reach out to him and make a connection. 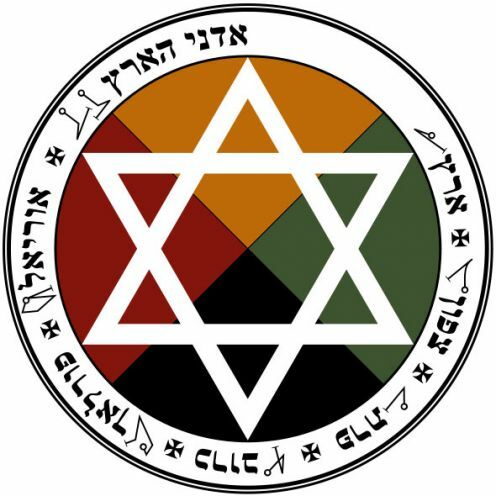 Site-wise, I made a few new pages that describe gematria in Hebrew and Greek (under Skills) and about the creation of the Table of Practice and the aforementioned earth pentacle (under Crafts) with pictures. I also uploaded the lamen templates for the angelic kings of the elements to the Design section. Now if only the next set of coursework would come out soon, I could get on with building an altar. Weapon-wise, I’m making the fire wand once I get all the supplies, I just finished the earth pentacle, and I have a fantasy dagger and old plain piece of stemware (I think it’s a sherbet glass) for the weapons of air and water, respectively. Until then, onwards with the elements of air and fire!